Widely regarded as the favourite motorcycle of dispatch riders during the Second World War, the 350cc Matchless G3L pushrod single was respected for its ruggedness and durability, and Gordon May’s latest book, Overland to Vietnam, tells the story of his epic 11,500-mile adventure on a 1941 GL3 in 2015. 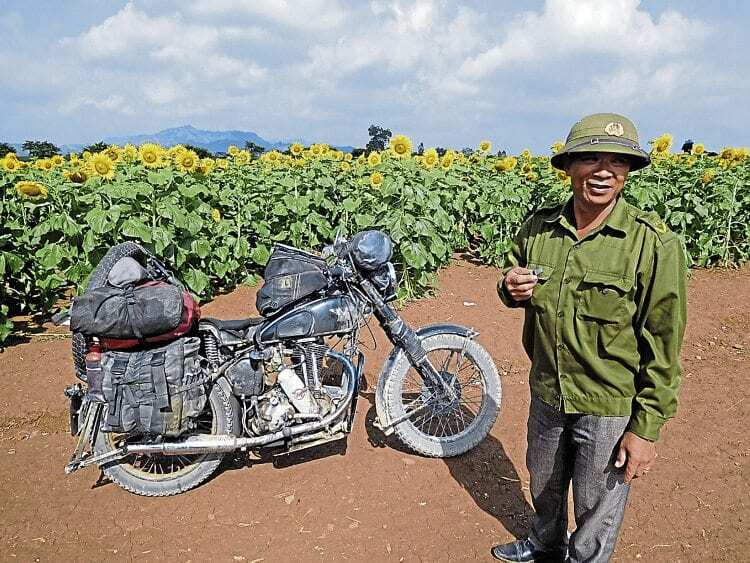 On a sunny day in more ways than one, a Vietnamese policeman is seen with the well-laden 1941 Matchless. The machine, which was only recently repatriated from Myanmar, will be exhibited exactly as it finished the journey, among the private entries area at the Carole Nash International Classic MotorCycle Show at Stafford over the weekend of April 22/23. Gordon’s book is an absorbing read as it tells the entire story of his trip, from the restoration and preparation of the Matchless with a team of friends to the conclusion of the journey, but although there are two glossy eight-page sections of colour photographs, don’t expect a picture book! With no on-road support team, this was Gordon’s most challenging ride so far, and the route took him across eastern Europe, the Caucasus and the Karakum Desert in Turkmenistan before he travelled over the Kunjerab Pass, the world’s highest paved international border crossing which separates China from Pakistan.